The Hello! Project Best Shot series of mooks are periodic publications by Wani Books containing a selection of shots from recent photo books as well as a selection of shots taken for their magazine, UTB. From the two that I have, it looks like they also provide something new as a feature, probably to make it worth your while. For this edition, released early 2015, we have a BeriKyuu feature! Seeing the members of ℃-ute cry when we told them about our hiatus, I was reminded once again of these wonderful companions that we had. They understand our feelings, they're comfortable to be with, it's like we're one big family. I imagined that they would be surprised when we told them of our hiatus, but I never would have thought that they'd break down in tears. And since it was before our concert rehearsals, we were in a panic, thinking 'OMG! We made them cry before the rehearsals!!' (laughs). When it comes to ℃-ute, I'm not worried at all about the other four besides Maimi (laughs). I think that Maimi might be feeling the pressure, suddenly becoming Hello! Project leader. And up to now, there have been times when she's depended on me, so I felt that it was inexcusable to make her suddenly go from that to being entrusted with everything. But since I knew that Maimi would properly watch over the kouhai with her gentleness and sense of responsibility, I expect that she'll be a good senpai. My top BeriKyuu memory was when everyone celebrated my 21st birthday in the middle of BeriKyuu's tour. On-stage, Chisato thanked me for being born into this world, and those words made me really happy. It's sad to part, but in the future, I'd like to cheer ℃-ute on as a friend and as a fan. I too would like to learn lots of things, and do my best as a 23 year old woman. If you were to ask me about BeriKyuu memories, I'd talk about our very first movie, 'Koinu Dan no Monogatari'. That's when we started to deepen out bonds. We messed around together, and even got into fights, all sorts of things happened (laughs). Because of those memories, when I heard that Berryz Kobo would be entering a hiatus, for a moment, I was hit once again with how long we had been doing this. We had been so small, and yet the time had come for them to make such a decision. Of course it's sad to part, but I hope that all of Berryz Kobo will continue to challenge all sorts of things from now on. Since I'd like us to maintain our unchanging relationship forever, I'd like to meet up with them occasionally. Since all of them will be going down new paths, it'll be fun to listen to their stories of a different world that isn't just Hello! Project. Probably by that time, all of Berryz Kobo will probably seem like such adults. Up to now, we've been in the same environment, and I think that they'll have a good look at worlds that we don't know about, so we can't let ourselves be left behind (laughs). Berryz Kobo said to us, 'Do your best to make up for our part', and I feel that we can't let the things that Berryz Kobo have done in these 10 years disappear. For that not to happen, we have to keep continuing on. As Hello! Project leader's as well, I'd like to do my best with that resolve. Saki, are you worried about me? (laughs) Borrowing everyone's strength, I intend to do things in my own way. I really remember the first time we appeared at a Hello! Project concert, and all of us had to introduce ourselves. It was just a self-introduction, but we were really nervous. My comment was 'While we total 15 in number, I'll do my best to stand out! ', but I haven't forgotten the sight of each and every one of us earnestly practising the comments we would be giving. Like who said what, and what we all said together. That shows you just how much we practised (laughs). Berryz Kobo will be entering a hiatus, but I'd like to maintain an unwavering relationship with all the Berryz Kobo and ℃-ute members. I will still remain in Hello! Project, so I'd like to have a meal with the members of ℃-ute when we have concerts together (laughs). I plan to drop by their dressing room, so I'd be happy if they received me without any awkwardness. I'd like to have a relationship where it's possible that I might enter the room at any time (laughs). Also, I'll be active as part of Country Girls after this, so I'd like to do my best to support the kouhai. Because the members of Berryz Kobo are from my own generation, I'm not used to all of the others being kouhai. I'd be glad if I could lead them by example. Also, I'd like to do my best to polish myself further. The other members of Country Girls are still undergoing compulsory education (laughs), so I'll be able to experience lots of things while they're at school...... I'll do my best so that my 2nd life as an idol won't be any lesser than my life in Berryz Kobo. I still can't imagine it at all, that what we've continued on doing for 10 years with be gone in a flash. Since I'd spent all my time from my childhood until my days of youth as Berryz Kobo, it's unthinkable to me that I won't have Berryz Kobo activities. Will there be an outpouring of emotion at the Budokan? The hiatus is something that we decided on, but I still can't imagine it even now, lots of question marks pop up in my head (laughs). However, when it comes to the future, my dreams have expanded by a large margin, and there are a ton of things that I want to do. I'd like to travel overseas, I'd like to try training seals, and I'd like to get certified as a dental assistant (laughs). After the 3rd of March, I'd like to try out the things that I want to do little by little at my own pace. Those dreams are also things that I encountered through my activities as Berryz Kobo, so these 10 years truly were something huge. To ℃-ute, I hope that they do their best to not lose to the young kids. But with the current ℃-ute, it'll be completely fine. With ℃-ute's activities, their dreams are expanding as well. If we could pull it off, I'd like to go on a trip with ℃-ute and Berryz Kobo. Also, another thing I want to do is play cards again! At last year's Countdown Live, all of us played cards, which was a lot of fun. Despite all of us being proper grown-ups, we were excitedly having fun playing cards like we were kids, it really was 'us' (laughs). In these 12 years, BeriKyuu's relationship hasn't changed. I'd like us to all play cards again someday, and reaffirm our bonds. Starting from next summer's Hello! Project concerts, ℃-ute will be in the top-most position, but if it's ℃-ute, I have no worries about passing the responsibility for Hello! on to them. It's not just because they're the oldest in age, but I'd also like ℃-ute to lead in feelings, I think that's something that they can do. It would be kind of rude to say that I'm still not entrusting things to the kouhais, but I think that with ℃-ute doing their best, wouldn't Hello! Project be more charged up as a whole? While I've got peace of mind in that respect, it's sad to be parting with all of Berryz Kobo and ℃-ute. While it's the result that we came up with ourselves, it feels like a gaping wide hole has opened in my heart. But it's not like we can't meet up, so I hope that our relationship doesn't change. On the contrary, the way I use my time may change from how it's been so far, so I expect that I might be able to meet up with ℃-ute even more. If our times match, I'd like to go on a trip, and would it be all right to enjoy ourselves overseas rather than domestically? Well, looks like I'm thinking about it pragmatically (laughs). As for the future, I'd like to focus on the acting that I enjoy. I'm watching all sorts of plays and movies in order to study up, and I'm thinking about doing the things I couldn't really do in order to prepare for the future. And it would knock my socks off if Berryz Kobo or ℃-ute would come and watch a play that I appear in. Speaking of BeriKyuu memories, it'd be the outfits for 'Ganbacchae' for me. All of our outfits were matching, but they had our names on them. Nowadays, it would be unthinkable to have such outfits (laughs). But maybe that's a good thing about the Hello! Project Kids, that feeling of unity, it's fun to look back on. At first there was a bit of embarrassment despite our childish hearts, but all of us did our best wearing those, and now it's a nostalgic memory (laughs). When Berryz Kobo enter our indefinite hiatus, the only ones from our generation in Hello! Project will be ℃-ute, but I've got no worries about ℃-ute. Since I expect that they'll definitely lead Hello! Project, I think the kouhai will have nothing to worry about, and they'll be fine if they follow ℃-ute. That's how brilliant I think they are, so I hope that they'll be confident and move forward. Also, ℃-ute are the only ones who have known Hello! Project from the first generation. I want them to convey to the kouhai what we inherited from the senpai. As for the future, there's just so many things that I want to do (laughs), so for the time being, I'm thinking about giving everything a try, and it would be nice to find something that really fits me, and continue on with it. In the future, I'd like to fully utilise my time on things that I like. I'll definitely go to ℃-ute's concerts! I'm already looking forward to watching them as a member of the audience! Now, watching videos from the past make me naturally get overwhelmed with emotion. Anything you do will eventually come to an end, so it's not like we would continue to be idols forever, and that a day would come when we'd graduate like the senpais of Morning Musume。 The other day, I rewatched BeriKyuu's 'Amazuppai Haru ni Sakura Saku', but all of us were like students, wearing matching hakamas, and I felt the graduation mood once again. 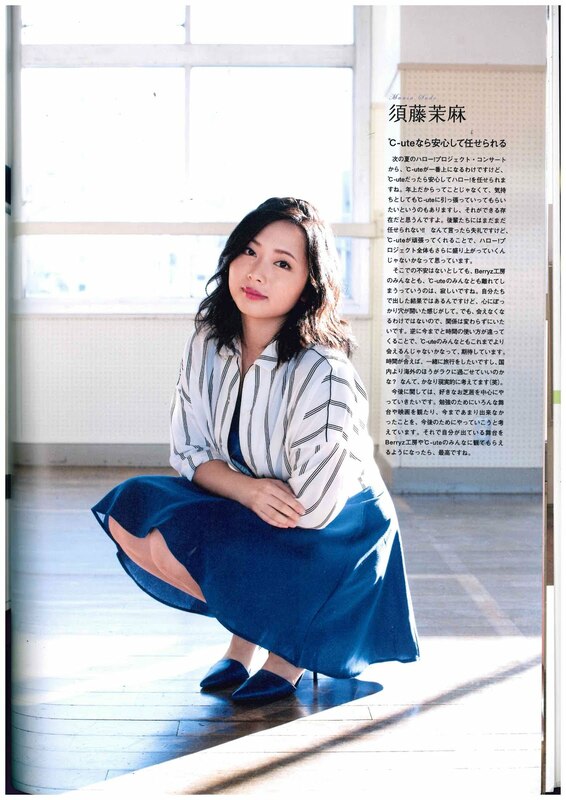 '...Sakura Saku' is a song comes from the sole time in our 10 years together when we had full-blown work linked together with ℃-ute, so in that sense, it left a really deep impression on me. All of ℃-ute are adorable, admired even by girls, and even I find them truly fascinating. I do want them to lead Hello! Project. Even when I'm not Berryz Kobo, I'll cheer them on as a fan. Perhaps the time will come when ℃-ute will also start thinking about going on a different path in the future. At that time, I'd like to be someone who can support them as one of their companions. Up to now, I've been continuously been doing idol activities, so I still can't imagine a lifestyle beyond that at all. At any rate, I'd like to get a driving licence (laughs). No matter what I do beyond this, I don't want what I've done before as Berryz Kobo so far to go to waste, so I'd like to proactively challenge a lot of things, and find a new me. When I heard from Berryz Kobo that they would be entering a hiatus, I thought of it as something that was still far off. However, in the blink of an eye, we're already at this point. We normally have different activities, but I think that the times when we worked together were precious. But with opportunities like today's photo shoot, it's because Berryz Kobo won't be around...... Through these jobs that we're doing together, the realisation that they truly are going on their own separate paths makes me excessively sad. My biggest memory of BeriKyuu is when we did a concert at Yokohama Arena together. They were the first concerts where the 2 of us had been combined together, ℃-ute were still complete newbies, and we were frantically catching up to Berryz Kobo. And in the future, it feels strange that we'll be the group at Hello! Project's forefront. Thinking of it that way, it's amazing how Berryz Kobo were always ahead of us. They made their debut earlier than we did, and thinking about all sorts of things from when we were small, I think that's why there's the Berryz Kobo of the present. Everyone's level-headed, and seeing the sight of them dealing with their own opinions at concerts, it motivated me. It's also amazing how they discussed and decided upon the hiatus by themselves. 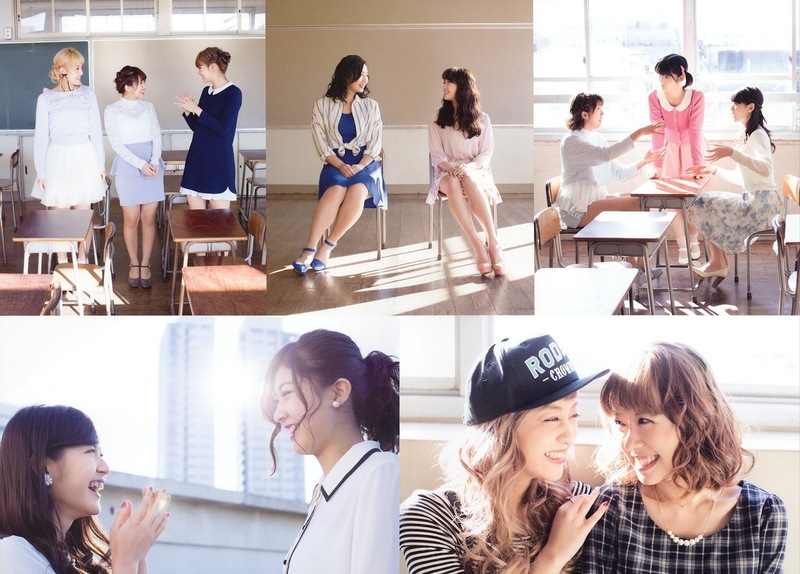 For ℃-ute, Berryz Kobo were always one step more grown up than we were. Even though they'll be going on different paths from now on, I want them to do their best to enjoy themselves with all they've got, and I also hope that they'll watch over ℃-ute. In our private time, I'd like to just go to the hot springs normally. I'd like to make plans (laughs). We've been together ever since we were small, so it's strange that BeriKyuu will come undone, it truly is sad. I'm sure that if I hadn't met BeriKyuu, there would be girls that I wouldn't have become friends with, or girls that I wouldn't have met in the first place because of our ages. But, I think that we'll meet in our own private time, and we can go and watch concerts, so it's not a lifelong separation. It feels like our homes have just gotten a bit distant. While it does feel a bit sad to part, I look forward to watching ℃-ute as a member of the audience. I wonder how it'll feel (laughs). I hope that ℃-ute will always remain the way they have been so far. The 5 of them have lovely personalities, and on-stage they have this sense of unity that Berryz Kobo lacks. Berryz Kobo and ℃-ute did a unified Yokohama Arena concert together, and getting to sing 'Very Beauty' with Airi at such a big stage is such an unforgettable memory. After our hiatus, I'd like to try out things that I haven't tried out so far, and I'd like to take the time to take another look at myself. In these 12 years, there were lots of things we did as Berryz Kobo, so I'd like to do a lot of new things as an individual 21 year old woman. The first thing I'd like to make time for is cooking. I can cook normally, but I haven't done it at all recently. My womanly skills have gotten distant, so I'd firstly like to make a new start on that (laughs). I've got lots of memories of Berryz Kobo. For better or for worse, our 2 groups were always compared, so we were both aware of one another. Looking back on what we've done up to now, Berryz Kobo was always there. Berryz Kobo are also the ones who always give us an outside opinion, and at Hello! Project concerts, they'd tell me things like 'Airi, you were good at that part'. After this, there'll only be kouhai, and there'll be no one who'll give us their opinions. Having your sole contemporaries as companions really was something huge. We'll become the most senior in Hello!, so I'd like us to steel ourselves and be senpai who can lead by example. I think it would be great if we could inherit the good influences from all of Berryz Kobo as well. I hope that they'll challenge new things while making use of what they've learnt in these 12 years, and I'd like them to fully enjoy the things that they couldn't do. We'll always be companions, even if we aren't BeriKyuu. Our precious relationship won't change. At first, I couldn't accept Berryz Kobo's hiatus at all. I was sad and hurt, to the point where I'd say 'I don't want to live any more!' However, I was able to understand that there must have come a time when Berryz Kobo themselves thought the same way. They also made their debut earlier than us, so while I feel like they're moving ahead of us once again, I also feel like I should give them support as it's a decision they made after having made discussions. Of course it's sad to part, but now I would like us to remain with lots of fun memories. And while I don't really take photos normally, I got a digital camera. I've taken a lot of photos, though that's just been today (laughs). Looking back, there really have been a ton of BeriKyuu memories. Like being filmed for movies, or doing combined concerts. Also, the minor incidents that happened backstage at Hello! Project concerts will remain as really amazing memories. Each and every one of those moments are truly nostalgic. I hope that Berryz Kobo will be truly happy after this. It would be great if they could enjoy themselves and live happily. We've talked about going for meals. I'm messaging Miyabi-chan and Risako-chan...... (Looks at Tsugunaga Momoko who is next to her) Though I still haven't for Momo-chan (laughs). Since Momo-chan seems like she'll be busy with Country Girls (laughs). So I'd like to talk again at leisure and add to our memories. Even at concerts, there were times when we were fine if Berryz Kobo were there. They have this strength that accompanies them, and they are reliable, but after this we'll have to do our best as the topmost. Up to now, Berryz Kobo have constantly held a weighty place in our hearts. Thinking of it in that way, there are lots of things that we 'owe' to Berryz Kobo. Being idols, there have been lots of things that were happy and enjoyable, but there were just as many hardships. So I hope that the members of Berryz Kobo will relax and enjoy themselves. It's not that I think that it's great to stop, but I wish that they'll enjoy themselves each day, in a way that they would think that they're currently enjoying themselves. And in the midst of that, it'd makes us even happier if they watch over ℃-ute.